As part of the 2015 POPSUGAR Insights Food study, we surveyed female visitors to POPSUGAR to better understand their grocery-shopping and food-consumption behaviors. We asked women to share with us their weekly meal-preparation behaviors and tell us the types of products they typically eat at certain meals. 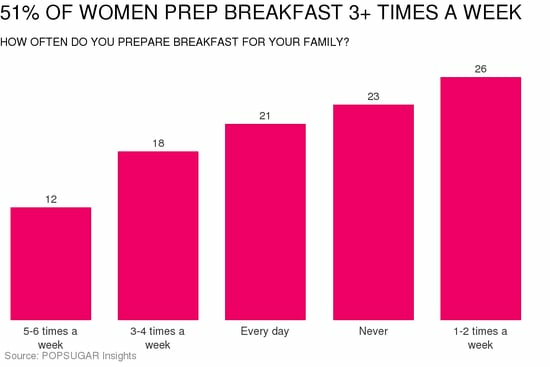 For breakfast, 51% of women we surveyed said that they prepare breakfast at home 3+ times per week. Twenty-one percent of women make breakfast at home every day, and 23% of women said they never prepare breakfast at home. Among those who do, 26% of women said they prepare breakfast 1-2 times per week, 18% said 3-4 times per week, and 12% said 5-6 times per week. Among breakfast foods purchased in the grocery store or market, perhaps not surprisingly, eggs ranked number one overall with 82%. Yogurt ranked second overall, with 64% of women saying they typically purchase the product in the grocery store. Oatmeal ranked third overall with 58%; followed by bread (52%); bacon, sausage, or breakfast meats (45%); and cold cereal (44%). Six percent of women said they skip the most important meal of the day completely.